Since Randonneuring involves extreme long-distances, it’s tempting to ask why the club would bother to schedule the shorter populaires. For example, the Toronto Chapter has a 23km populaire in its route archive, The New Year’s 23. This Sunday, the Toronto Chapter will be holding its Rouge Ramble, a 60km populaire. In a club with members aspiring towards completing rides of 200km and longer, why would anyone do a ride of only 23 or 60 km? Well, I have some answers. Here are some good reasons for riding populaires. Building Endurance: It takes time to build up your endurance. Populaires tend to be scheduled at the beginning of the season, precisely in order to help members get conditioned for the longer rides. If you look at the populaires in the Toronto Chapter Schedule, for example, you’ll notice that each ride gets progressively longer. If you complete a series of populaires in March and early April, you will be well-prepared to take on The Gentle Start 200k, happening this year on 14 April. Testing equipment, nutrition, pacing: There is a lot of trial and error in long-distance sports. Randonneuring is no exception. The more experience you have, the better you will be at ensuring your comfort and enjoyment. For example, discovering you have no idea how to keep your toes warm and dry on a 60km ride is not nearly as horrible as learning that lesson on a 200km ride. Observing your nutrition needs as the distances gradually increase will help you better understand how much food to bring/consume. The list goes on. It’s fair to say that experimenting with equipment, pacing, hydration, and nutrition is an ongoing process for every randonneur. Populaires will enable you to conduct your experiments on shorter rides where errors will be less of a problem. Team-building: Riding populaires is a perfect way to meet other club members and to identify the ones whose goals and abilities match your own. This is another good reason for holding populaires early in the season. Having found “your people” early in the year can help reduce the chances of riding alone on the longer brevets. You’ll begin rides with your friends and acquaintances, not a group of lycra-clad strangers. And who knows? You might gel so well with people that you can put together a flèche team for May. That’s all I have for now. Other contributions, suggestions and ideas are most welcome. With their plush wheels and endurance frame geometry, bicycles are becoming more comfortable and cyclists are riding farther. These days, it is not uncommon for riders to exceed distances of 100km. And more and more riders are setting their sights on the imperial century (100 miles or 161km). Can the average cyclist ride farther than 100 miles? Randonneuring is a branch of cycling that enables you to exceed this distance at a comfortable pace, in the company of like-minded individuals, and along routes that have been ridden by a club for many years. If you are already comfortable riding 120-160 kilometres you might be considering 200 kilometres as your next goal. Randonneurs Ontario have a wide selection of 200km routes all over southern and central Ontario. 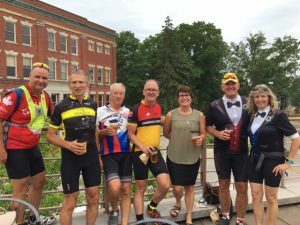 With start locations near Ottawa, Barrie, London, Windsor, Port Elgin, Waterloo, and the GTA, chances are you can find a 200km brevet that starts near you. A brevet (Pronounced breh- VAY) is a French word we use to designate an official and scheduled randonneuring event. There are brevets of many distances. Each distance has a pre-determined time limit. Let’s just focus on the 200km distance. What is the time limit for a 200km brevet? You must complete a 200km brevet in 13.5 hours or less. What kind of rider is able to complete a 200km brevet? To guide you through this question, it might be best to introduce you to some of our members. That way you can see for yourself that there is more than one way to finish a 200km brevet. Whether you want to enjoy every second on the road and use all 13.5 hours, or you want to test your speed and finish as quickly as possible, riding 200km brevets with Randonneurs Ontario is something you can enjoyably do. 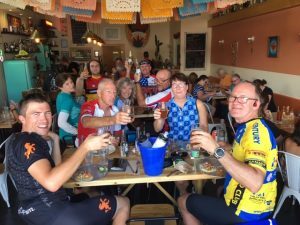 Why did you start randonneuring? My brother told me about the sport of randonneuring. He knew how much I loved cycling and he thought it was the perfect sport for me. When I heard about how they cycle 200 kms in one day… I thought they must all be super fit cyclists, way beyond my level – it scared me. Then I met some of them the following year at the Toronto International Bike show and they were so normal and down to earth… so I decided to try it. I loved it! This was a group of people who were out for an enjoyable day while riding a bike. We chatted while we rode, we stopped for photos, we had an amazing lunch break at a pub, it was great fun! I never felt intimidated at all. By the end of the ride, I was sorry it was over! What do you enjoy most about a 200km brevet? It’s hard to say which is my favourite 200 k brevet because there are so many things that make something a “favourite”. I will never forget my first 200 k brevet which was Kemble Rock 200. Everything about that first-time experience was exciting – the scenery along the lake shores, the hills and valleys, the rivers and small towns along the way, the company and the cafés where we stopped for breaks. Sometimes the most memorable 200 km brevets were the ones that were the most challenging – due to weather, specifically torrential rain and gale-force winds – they were not my favourite at the time but they sure felt like an accomplishment! There is something special about every 200 km brevet I have ever done. I guess my favourite one is the one I haven’t done yet because it will become yet another memorable experience! I’d read some blogs about randonneuring and PBP (Paris-Brest-Paris) specifically… I had been putting off trying an official 200K brevet because I didn’t want to drive somewhere to ride my bike. But since the only way to qualify for PBP is by completing brevets it became a “now or never” thing for me. I started doing the clubs shorter rides, called populaires. I learned a lot during the populaires, especially about navigation. I didn’t make it to PBP back in 2015 but I certainly developed a taste for randonneuring. I love the 200K distance because of its flexibility… in the summer it’s quite possible to stop and sit down for a lunch and still finish in the daylight. There’s almost always time to stop for a photo or an extra coffee. For a challenge it’s a good distance to try and go for personal bests. Doing a 200K is only a day commitment, usually it’s possible to do something the day after riding one. The generous time limit on a 200 is also nice for bringing friends along… I’ve brought a couple of friends on their first 200s and we made sure to spend enough time off the bike to make for a very enjoyable day. Having a lot of events in a big province like Ontario also gives us the opportunity to make any 200 into a nice weekend away, since my partner is into riding 200s now it’s a nice little holiday. My favourite 200 is probably The Big Chute, but I have only ever ridden one 200 in the Ottawa area and I really enjoyed that one too. Hills of Hockley is probably a close second favourite of mine, it’s especially scenic, and challenging too… I’ve done Hills of Hockley more than once. One of my fastest 200s and one of my slowest 200s is on that route! I suppose I will keep riding 200s that I haven’t done yet so I can answer this question better. Originally, I wanted to do the Paris-Brest-Paris. It was a very important reason for me to join the club. Then work and family responsibilities kicked in and I realized that I would not be able to do PBP. I still hope to do it one day, but I can wait until my kids are all grown up. In the meantime, I just keep riding in Ontario. I love doing brevets. It’s such an amazing way to see the province. The brevets are definitely the high points of my year. I like that it is over in one day. Sometimes I can finish quickly enough to be home in time to have supper with the family (but not always…) I also like the possibility of riding at a higher pace on a 200km. With proper training, teamwork, favourable conditions, and a lot of good luck, it is possible to get a 200km done in 8-9 hours. This is hard to say. Every 200km brevet is an adventure. That said, the 200km route I have done most often is the Scugog Circle. It starts in York Region on roads I have ridden since the 1980s, so that has a certain charm. The ride along River Road on the east coast of Lake Scugog is a really nice stretch. I look forward to riding on it every time I do the Scugog Circle. I’d been interested in randonneuring since I’d first heard about PBP in the early 1980’s. I can’t remember now if I read about PBP or heard about it from one of the people I worked with at Sunwheel Bicycle Couriers. It sounded like a terrific thing to do but I didn’t think I was fit or fast enough. I may have thought this because the people who hung around Bicyclesport, owned by Mike Barry and Mike Brown, among the founders the Toronto Randonneurs, were notoriously strong riders. It was a mistake. I wasn’t as fit or fast as them but in retrospect I’m sure I could have made it round a 200 within the time limit and then built up from there. After this procrastination took hold and it wasn’t until twenty years later, a fortysomething office worker rather than a twentysomething bike messenger cycling nine or ten hours a day that I actually rode a 200. In the early part of the season, when, for me at least, fitness is a bit uncertain after the winter and I’m working my way up in distances the 200 is the first real test. After I’ve successfully done a 200 I feel like there’s a natural progression to the longer distances and that as long as I keep riding a reasonable amount I’ll be fine on the longer brevets. (There may be a certain amount of self-delusion at work here but it’s helpful nonetheless.) In the later part of the season, after a 300, 400 and 600, and perhaps longer, the 200 feels like a manageable distance, not requiring much preparation or worry. It’s just a nice day out on the bike. I’m not sure I have a single favourite route. I’m very fond of the Chenaux 200. 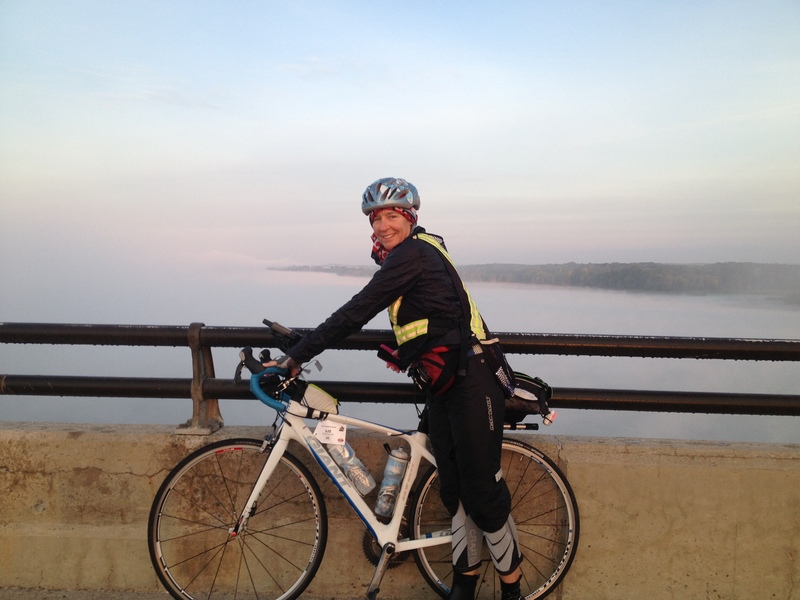 The ride along the Ottawa River and crossing across the dam at Portage-du-Fort are highlights of the route. It also includes a ferry ride. The South Lavant 200 and new, excitingly gravely, Deliverance 200 are also favourites. I joined the RO earlier this year in order to familiarize myself with randonneuring and the structure of brevet events to better prepare for PBP 2019. Brevets are a great way of exploring new and challenging routes in and around popular cycling destinations. Personally I love looking forward to a new adventure every weekend. It’s a great way of staying focused in the early part of the season while building a solid base. Why do you enjoy most about a 200km brevet? The 200k distance is particularity challenging as it requires some prior long-distance experience. Usually this is a stretch goal for most weekend warriors that may have previously completed centuries in the past. It also represents a natural stepping stone towards longer brevets. The way one would approach a 200k brevet is different than a 100 or 160km ride. Nutrition begins to play a much bigger part and requires the cyclist to pay extra attention to the timing of calories. When tackling a 200k brevet one is essentially committing to a day in the saddle and time spent off the bike plays a bigger role. On the fast end it’s a distance that can be completed in 7-8h but it can easily require the entire 13.5 hours. What I love about this distance is that you get to watch the day unfold, sunrise to sunset in most cases. Also, a lot can happen over 200km of terrain and it truly is an adventure. I don’t really have a favourite 200km brevet, so I’ll just discuss generally what I like about randonneuring. One of the main reasons why I chose to ride brevets this year is because I knew it was a great way to connect with friends and bond over some spectacular adventures. I’ve been cycling for over 25 years. That is a lot of alone time. Over the years I’ve missed the social aspect of cycling and brevets offer a chance to share some of those long lonely miles with others. Witnessing friends set new PBs makes it extra special and very meaningful as well. Spending the day together with like-minded individuals and sharing meals is a beautiful way to spend the weekend. Cycling for me has never been about the numbers. The greatest memories I have are ones where I’m paying attention to all the little things. Taking the time to capture the right moments, getting lost, connecting with people along the route, and above all sharing the hardships with others. Whether you’re a weekend warrior, PBP hopeful, or club racer, brevets offer something for everyone. The type of experience one is after depends completely on the individual. I had discovered the sport of randonneuring in 2000 at the Toronto Bike Show. I immediately thought about qualifying and attempting the PBP in 2003. I thought it would be a once in a lifetime event! I like the company and the good times. For example, The Much Ado About … 200k was developed by Terry Payne. Terry had started Randonneuring with the Huron Chapter and offered putting together a 200 in London. The first time we scheduled this ride was in 2012. Terry and I kidded each other that it was a shame to pass through Stratford without seeing a play. Well, in 2015 we decided to add the play “Taming of the Shrew” to the ride. We have added a play ever since (3 plays have been attended now!). This year’s play was “To Kill a Mockingbird!” I asked the Randonneurs Ontario to add the play to the name of the 200 and post it on our website. Now, we will schedule the Much Ado About … with a play and include it in Huron Chapter’s Schedule every year. I now schedule the Much Ado About … based on the play we can attend with a Start Time of 0700hrs to allow us enough time for lunch at the Boar’s Head Pub in Stratford before heading to the play. The Huron Chapter developed what we call the Entertainment Series, the 200 has a Play, the 300 has an 18 hole Mini-put Championship, the 400 has the Creemore Classic Bowling Championship and a 600 with a Go-Cart Championship! This year’s Go-Cart Championship happened on a 400 do to route changes. Big Bay 200 is my favourite! So there is more than one way to take on the challenge of a 200km ride. No matter how you do it, it’s bound to be a great time.